Feeling crafty? Here’s a fun new way to add some color to your yarn box and get yourself in the mood for spring! 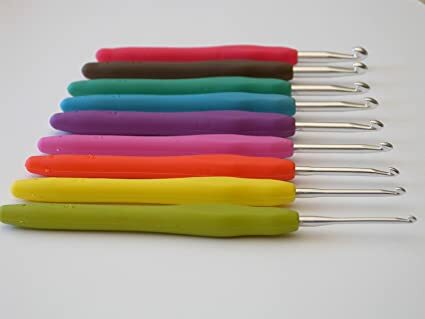 This set of colorful crochet hooks, designed by Sparkling Pumpkin, are just as practical as they are whimsical. The nine hooks range in size from 2mm to 6mm, great for everything from delicate open woven designs to bold and chunky blankets and scarves. The ergonomically designed non-slip grip handles, made of a safe and durable TPR material, make the grips more comfortable to use. While these do add a delightful splash of color to your crochet experience, even their appearance serves a function – the color coded handles will help you easily select the right size hook quickly even if your craft space is a little less than perfectly organized. Sparkling Pumpkin has even included a special organizer to go with the set, to keep the hooks tidy and looking great on display! These hooks are a great way to treat yourself to something fun and inspire you to begin all of your creative crochet projects. Even if you are not into crocheting yourself, their spectacular visual appeal makes for a great gift. They’d be the perfect addition to a grown-up Easter basket for any yarn crafting people on your list. Priced at just $16.99, Sparkling Pumpkin’s array of brightly colored crochet hooks is an affordable indulgence for yourself, or a meaningful yet low cost gift for a fellow crochet enthusiast. These hooks are available on Amazon here, and where you can also browse Sparkling Pumpkin’s selection of creatively colored crafting essentials.